Camp St. Sophie is a non-profit summer camp open to all children ages 7-15 interested in the Orthodox religion, Ukrainian culture, arts and crafts, music, culinary arts, drama, outdoor activities and sports. Our camp leaders speak Ukrainian, French, English and other languages. We provide campers with delicious home-made and healthy food. Campers are provided with a safe, fun and wholesome environment in combination with great meals and a beautiful church in which to worship together. The program is organized by a group of volunteers whose primary focus is on the preservation of our Ukrainian Orthodox heritage. The children's summer camp is located in the town of Chertsey, approximately 70 kms from Montreal. The camp is more than 50 years and is located in an area surrounded by magnificent pine forests and water. 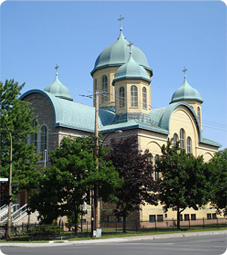 In 2008, Metropolitan Yurij, Primate of the Ukrainian Orthodox Church of Canada, declared Camp St. Sophie as the official camp of the Eastern Eparchy.